The Helmet Mount for Wilma/Wilma R securely mounts your Wilma lamp head to any vented helmet using a Lupine hook and loop fastener strap. The mount keeps the light beam front-and-center, where you need it while on any nighttime adventure. Only suitable for new 3200-lumen Wilma (with or without Bluetooth). INCLUDED: Wilma Helmet Mount and Lupine hook and loop fastener strap. Precision-engineered in Germany using the highest-quality materials, Lupine accessories are built to withstand rough terrain, extreme weather, and excessive use. 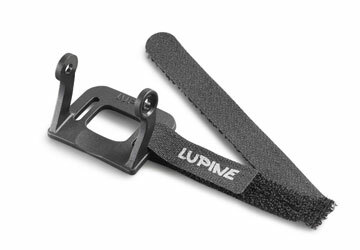 The state-of-the art Lupine hook and loop fastener strap keeps your light mounted in place, just where you need it- ideal for mountain biking through the woods or on rocky trails. The helmet mount is just one accessory in Lupine's lineup that boosts the versatility of your system. Add a headband to turn your Wilma into a headlamp for camping or running. Or, add a Quick-release Handlebar Mount to place your light on your bike handlebars. The possibilities are endless. Easily mount your Wilma lamp by securing the mount plate using the hook and loop fastener strap (included) through the ventilation slots on your helmet. If your helmet doesn't have air vents - no problem: You can easily mount your Wilma using the 3M Dual Lock Mount or the Lupine GoPro adapter.